With four weeks of football games in to the 2015 NFL season, and as we move onto Week 5, we look to see which of the more popular prediction systems, software, or models have been the most successful, and compare them to see which a regular fan should use if they do not know enough about handicapping. We encourage those that would use one of these models to do their own research and learn how to properly handicap this sport. We will take a look at two of the more popular names that have been floating around the internet, Nate Silver’s ELO Model and Microsoft’s Cortana personal assistant software. 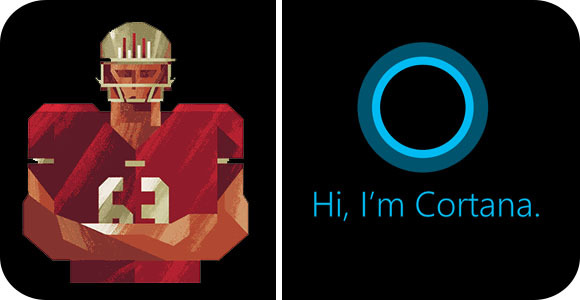 We have all heard of the magic that happened when Cortana was able to predict accurately the 2014 World Cup games, and that it had now started to dive into the NFL. We will now see what win-loss record each model has had and what could be the reason for it. Cortana uses: 2014 results, offensive and defensive stats, margin of victory, location, weather, and public sentiment. ELO Model uses: mathematical formula using past stats. More details can be read in their FAQ. The ELO model seems to use a wider range of information and makes use of a proven mathematical algorithm that takes into account many different variables that can happen during a football game. Cortana uses stats that are readily available and uses simple handicapping skills to determine the overall winner; however Cortana certainly has improved her model since last season, but still has ways to go to get more accurate. In the end, I would have to say that Cortana is more like a handicapping amateur, while ELO model is more of a high-grade statistician that takes more information to be satisfied in the answer. According to Silver and his model, there will be plenty to look forward to as many football teams are predicted to win on the road during the NFL Week 5 games.